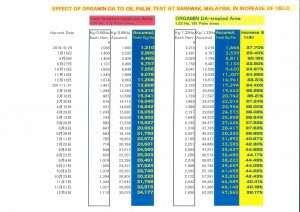 From May, 2016, ORGAMIN DA spray test is being run in Sarawak, Malaysia. ORGAMIN DA was splayed to palm trees, targeted to leaves, using knapsack type mist sprayer, at rate of 1.0 Liter per Ha. ORGAMIN DA spray was repeated every month. Palm trees planted at very similar land conditions were separated to a block of 119 trees(=0.88Ha) for non-treated control and to 181 trees(1.33Ha) for ORGAMIN DA treatment. Until the first harvest of December 2017, accumulated yield of FFB(palm fruits clusters) at ORGAMIN DA treated area reached to 47.57 MT/Ha against non-treated control area at 34.2 MT/Ha that means ORGAMIN DA treatment effected 39.2 % increase. End users’ price of ORGAMIN DA may vary by place to place of the World. But, it ranges from US$ 20.0 at to 25.0 per liter, at maximum. So, the material cost of ORGAMIN DA is possible to be US$ 20.0 to 30.0 per Ha for one spray. Round-year monthly spray material cost would be US$ 240.00 to 360.00 per Ha. What the ORGAMIN DA user will gain from this operation? What means, increased yield of oil palm fruits cluster in the field at about 40%? If it is constant increased harvest, as you see at above test report, no more cut down of the trees of tropical rain forest, don’t you agree?